The origami boat actually floats, and can be used in water that's relatively calm. 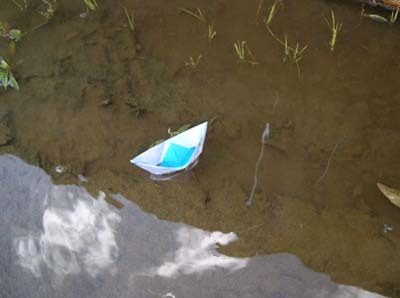 The paper will get soaked after a while, and the boat will get heavy and not float anymore. You can help it last longer by giving it a waterproof coat. For the boat below, we used clear water-based acrylic, applied with a paintbrush.